Opposite of the Town Hall, you find the Kaufhaus Tyrol. 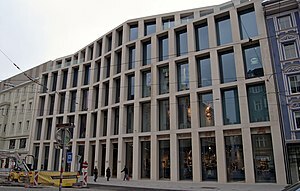 Its Innsbrucks newest architectural gem. This shopping mall once had a great history, but it lost more and more of it charm and wore down. Now it was completely rebuild – after plans made by David Chipperfield. The main facade was made of glass and concrete elements with white cement and marble. The main hall is illuminated from above by daylight. The different levels of the shopping centre are connected by bridges and elevators which cross the open space. In front of the Kaufhaus Tyrol there is the Maria Theresien Strasse – the historic main street of Innsbruck, which was re-designed in recent years, too. The Adambräu Brew House is an interesting point to visit for architectural fans for two reasons. Firstly it was adapted to its new use, by a group of Austrian architects (Rainer Köberl, Thomas Giner, Erich Wucher, Andreas Pfeifer) in an excellent way. 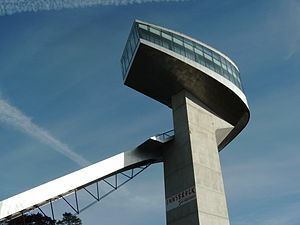 Secondly the new use is, to house the Tyrolean Architectural Institute (AUT) and the University archive for architecture. Behind Innsbruck there tower the massive mountains of the “Nordkette” which are about 2.300 high. There runs a cable car from the City Centre to the top of this mountains. This trip is not only providing you with stunning views onto Innsbruck, but also gives you the change to enjoy some of the most beautiful mountains of Tyrol. On the “backside” of the Mountains is a Nature Preservation Area, so you will have the City on one side, and absolutely no human civilization on the other. For architecture Fans the Cable Car itself is an important view – it was build after plans of Zaha Hadid. Every station on the way up, has its on design. It takes about 20 minutes to get from Innsbruck to the top of the mountains, but Architecture Fans might want to consider, to visit the stations on the way up (and therefore invest some more time). More information about Innsbruck – click here!